Immigration made trans-national New York possible. In 1910 forty percent of New Yorkers were foreign-born—most from Southern, Central, and Eastern Europe. They joined other newcomers: white-collar workers employed in skyscrapers; artists and intellectuals gathered in Greenwich Village; and the activists who made New York a center for urban reform and radicalism. These people spoke different languages and were often at odds. But together they created a dynamic, innovative culture that defied fixed conceptions of personal and group identity. Many key players in that process were German Jews: Lillian Wald, founder of the Henry Street Settlement; Armory Show organizer Walter Pach; and the Seven Arts critics Waldo Frank, James Oppenheim, and Paul Rosenfeld, among many others. 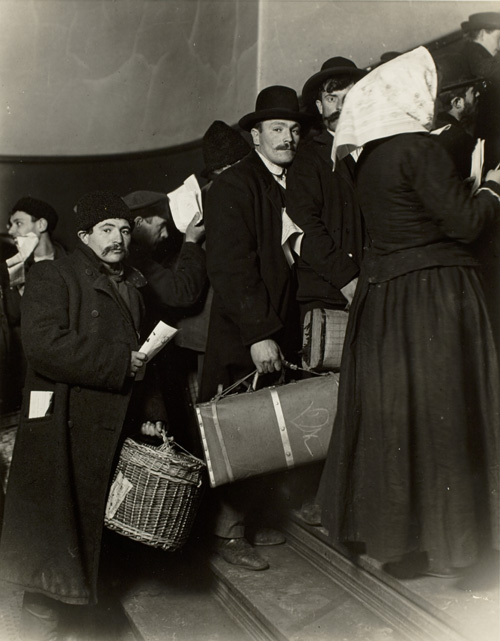 Felix Adler’s Ethical Culture sponsored Lewis Hine’s documentary photography, which depicted immigrants respectfully as fellow citizens. Such exchanges rarely included African-Americans in the 1910s, despite the city’s significant black population and the presence of NAACP leader W.E.B. Du Bois. It was only with the Great Migration and the Harlem Renaissance of the 1920s that New York cosmopolitanism began to challenge the color line. Randolph Bourne, “Trans-national America,” Atlantic Monthly 118 (July 1916), 86-97.